Spinal rehabilitation is a much more complex process than you might guess. If you’ve never taken advantage of chiropractic care, then you might think that chiropractic is confined to back adjustments. While this is a crucial element of chiropractic care, it’s not the only, or necessarily the most effective, means of spinal rehabilitation. 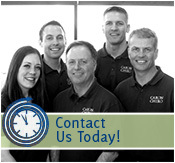 Different patients have different injuries and therefore different treatment needs, and that’s why we offer a variety of St. Paul spinal rehabilitation services. So that you can get as much out of your chiropractic care as possible and leave our office feeling better every time, we believe in a holistic spinal rehabilitation approach, integrating several treatments and physical therapy techniques into your individualized rehabilitation plan. This includes spinal adjustments, massage therapy, exercise regiments, and alterations to your daily activities that may be hindering your spinal rehabilitation. At the heart of chiropractic health care is the practice of spinal adjustments, often a necessary and highly useful spinal rehabilitation technique. Chiropractic spinal adjustments are used to realign your vertebrae in your neck and back with the aim of providing pain relief by targeting your pain at its source. By realigning a misaligned spine, or by ensuring that your spine is properly aligned, we are able to use spinal adjustments to rid your body of added tension and stress. We are able to reduce inflammation, relieve pressure from pinched nerves or stiff joints and muscles, and improving range of motion. All of these effects of spinal adjustments are crucial elements of spinal rehabilitation, especially if you’re suffering from a stiff back, neck, or joints and need to increase movement. Perhaps the most important aspect of chiropractic adjustments in proper spinal rehabilitation is the actual process itself. Although realigning vertebrae might sound like a simple task, it’s a complex process that requires proper training, and when a spinal adjustment is complete, it should leave you feeling “right” again. It may take more than one spinal adjustment to help your back realign, but once you undergo a spinal adjustment, you’’ have a smoother spinal rehabilitation, as your back will be in its proper position, and you won’t have to risk it healing incorrectly. Massage therapy is another significant element of spinal rehabilitation, which surprises some patients we see. However, massage therapy is a recognized form of treatment used for chiropractic care and physical therapy, making it a perfect addition to your spinal rehabilitation plan. We want to provide our patients with as thorough chiropractic care as possible, so we offer a variety of massages utilized for different pains. With deep and soft tissue massages, trigger point massages, and Swedish massages, we can offer a more individualized spinal rehabilitation massage therapy treatment plan, designed to help you recover as quickly and thoroughly as possible. If you’re in need of a deep-action massage with intensive tension relief, a gentler massage to enhance relaxation so that you can treat and prevent everyday tension, or a massage targeting your spinal area in particular, we’ll ensure that you have exactly the massage you need to help you on your way to spinal rehabilitation. To bring our spinal rehabilitation full circle, we place some of your rehabilitation needs in your hands with individualized exercise routines and plans for manageable lifestyle changes. We’ll use in-office spinal rehabilitation exercises to improve your range of motion, relieve tension and stiffness, and get you on your way to moving as you normally would before your spinal injury. While chiropractic spinal adjustments, massage therapy, and in-office exercise routines are crucial to effective spinal rehabilitation, they have to be accompanied by your own commitment to better spinal health and wellness. That’s why we not only treat your spinal injuries using in-office physical therapy exercises, we’ll create an at-home exercise plan that will help you play a role in your own spinal rehabilitation. In addition to the DIY spinal rehabilitation exercises we’ll give you to try out on your own, we want to make sure that we and our patients are doing as much as we can to promote lasting spinal rehabilitation. Because spinal injuries can be exacerbated by everyday activities that increase stress and spinal tension, making strategic lifestyle changes benefits many patients. We’ll help you identify areas of your daily routine that could be hindering your spinal rehabilitation, making your injuries more painful, or even causing your spinal injury so that you can eliminate harmful activities from your daily life and take your spinal rehabilitation into your own hands. If you’re suffering from neck or back pain or a spinal injury, call our St. Paul chiropractic care office today at (651) 255-9999, and begin your spinal rehabilitation today.